Ferrari California T using Turbocharged - The latest model of the Italian sports car manufacturer issued a variant of the "T" on the Ferrari California. 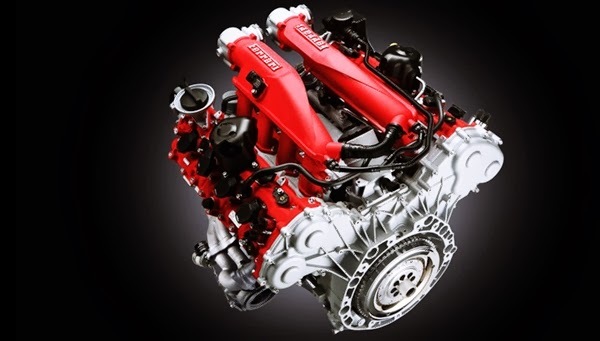 The latest model of Ferrari will be launched at the automotive event “Geneva Auto Show 2014”. Ferrari California T using the "T" for Turbo engine, does the Ferrari California T will be the most powerful vehicle from Ferrari. Ferrari California T using the new V8 engine with 3.9-liter turbocharged fuel direct-injection. Ferrari California T capable of producing maximum power 552 HP at 7500 rpm, with Maximum torque reaching 755 Nm at 4750 rpm. The maximum speed of the Ferrari California T is 316 km / h, and is able to run from 0-100 km / h in just 3.6 seconds. When compared with the Ferrari California, Ferrari California T clearly more powerful, despite using a smaller cylinder capacity. At Ferrari California uses 4.3-liter V8 engine that produces 483 HP and maximum torque of 505 Nm. But the Ferrari California T no longer use the turbo lag on the machine, that makes the machine more responsive, but by eliminating turbo lag, fuel consumption will be greater. But the Ferrari promises, that the V8 engine in the "Ferrari California T" will be 15% more efficient than the model Ferrari California V8 engine. Ferrari California T acknowledged having fuel efficiency of 9.52 km / liter with CO2 emissions of 250 g / km. Although using Turbo device, but still economical fuel consumption. Changes in the design of the Ferrari California T compared with Ferrari California: Changes in the bumper, the use of vents on the front hood, grille and larger, making the Ferrari California T more aggressive. "Article : Ferrari California T using Turbocharged revealed"